Whether you’ve purchased or built a new home, you want your abode to look its best. You want the interior to reflect your personal taste, and you’d like the exterior to have a certain appeal. Every measure you take to care for your home is to make your home an attractive and inviting house that passersby can admire from the outside and your family members can enjoy on the inside. You repaint the sides, add new features like stone columns, and carefully maintain the reachable areas. But of all the exterior features on your home, you likely don’t pay a lot of attention to the gutters, soffits, and fascia. Or, you may not even have these elements along the edges of your roof. Yet these features add a lot to your home’s functionality and aesthetic appeal. But do they really serve a specific purpose? Do you really need them on your home? What benefits do these structures offer you? In our blog, we answer these questions and other related ones so you know exactly why gutters, soffits, and fascia matter to your home. 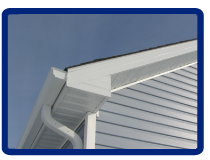 What Purpose Do Gutters, Soffits, and Fascia Serve? Although some homes don’t have gutters, soffits, or fascia, these features all serve great purposes. We explain these purposes in more detail below. Gutters are given a few different names, depending on which region of the US you live in. Likewise, they’re given different names in various countries. 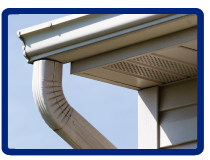 Some of the common names include rain gutter, rain catcher, eavestrough, guttering, eaves channel, and dripster. But despite the varying names, gutters serve one main purpose: to collect rainwater from your roof and move it through downspouts along the side of your home and away from your foundation. Gutters also help reduce erosion on your property as they channel water away from your home, reduce water exposure that damages the paint and stain on your home’s siding, and stops leaks in crawl spaces and basements. Additionally, the term “gutter” refers to the entire structure, which includes the trough, soffits, and fascia, that you find along the sides of your roof. The soffits are found underneath the troughs of your gutters, and they’re also connected to the fascia. Soffits are undersides, or baseboards, that bridge the gap between your home and the bottom of the gutters. They also can be ventilated so air can flow freely into that area of your roof. Without this necessary ventilation, condensation can form in the roof void (the empty space just under your roof and above the top ceiling in your home). When condensation collects in this space, the extra moisture can cause wood rot and weaken your roof’s structural integrity. Fascia are the long boards that run along the side of your gutters and the lower edge of your roof. They fix directly to the roof trusses and support the gutters and the bottom row of tiles on your roof. And because fascia are visible to passersby, they can accent your roof’s color and design to make your roof look more appealing. Fascia can also be ventilated on top to further ventilate your roof void. To better appeal to homeowners and their diverse tastes and preferences, gutters, soffits, and fascia can be made from a plethora of materials. Gutters can be made from vinyl, aluminum, galvanized steel, steel, copper, and zinc, with aluminum and vinyl being the most popular choices. You can easily find soffits made from vinyl and UPVC, but you can sometimes find soffits formed from recycled materials. Fascia, on the other hand, can be made from wood, UPVC, stone, and non-corrosive sheet metal. How Do You Clean and Maintain These Structures? Whether you’ve kept your gutters, soffits, and fascia in good condition, replaced your old ones, or installed new ones for the first time, you need to properly clean and maintain them so they can work properly. Remove all the plant life, branches, and debris inside your gutters. Use a tall, stabilized ladder and gloves to pull gunk from the troughs. Place the debris in a trash bag so you can throw it away. You may also use a small scoop if you don’t want to use gloves. Use your hose to flush water through the gutters and downspouts. Install gutter covers to prevent muck from accumulating inside your gutters in the future. Scrub the soffits and fascia with a soft sponge and warm, soapy water. Lightly rinse off these supports with water. Take care to keep water out of the ventilation openings so water doesn’t get into the roof void. You can also talk to your roofing expert for more tips on cleaning and maintaining your gutters, soffits, and fascia. If you would like additional information about these features and how they can benefit your home, get in touch with Beissel Window & Siding.